Published on April 14, 2015 in corruption, General T&T, Media, People's Partnership and UNC. 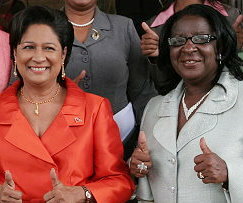 2 Comments Tags: Abuse, Express, Kamla Persad-Bissessar, Keith Subero, Politics, T&T Govt, Vernella Alleyne-Toppin. Yes, Minister Vernella Alleyne-Toppin’s contribution in the House caused the UNC Government’s no-confidence motion against the Opposition Leader to implode—rather than explode, as planned. Yes, Minister Alleyne-Toppin offended our collective sensibilities, and we remain offended, probably more so because the Speaker allowed the House to be reduced to the Minister’s barrackyard gossip. Yes, other political minutiae—such as the recent Express poll which rates the Prime Minister, in spite of her Government’s daily mis-steps, as being more popular than the Opposition Leader—are now occupying our attention.